My game group is currently playing Star Wars Edge of Empire / Force and Destiny. It's got some interesting game mechanics (including a proprietary dice set that you'll want a couple of if you're going to play yourself). 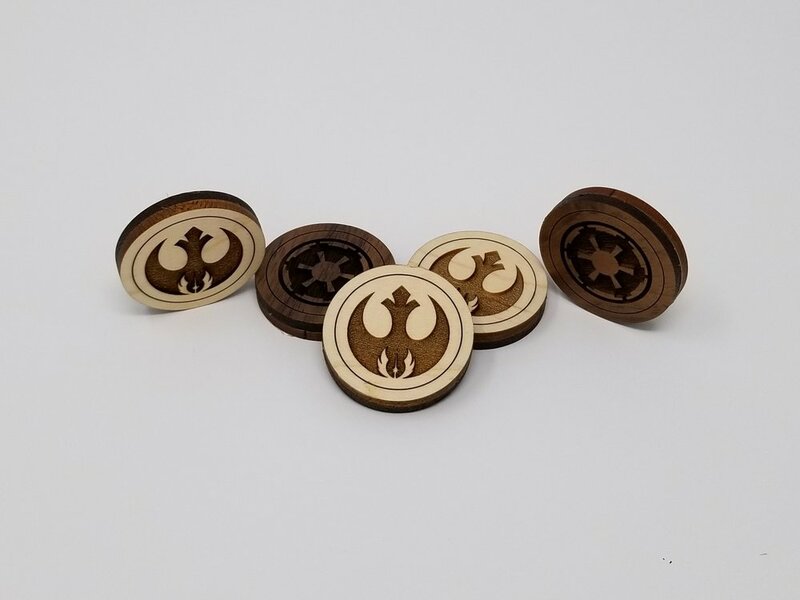 The dice come with some cardboard tokens that are used in the game as a resource pool that the players and the GM can flip back and forth to each gain certain boosts. Well no group of mine was going to be left using some crappy cardboard tokens, not when I have a glowforge. You use one per player and we have 6 people playing, so I made 6 tokens as a gift to my friend who is GMing the game. He wanted more to use for his larger game group so I made another set of 6 for a total of 12. He has 7 of them, so I only had 5 to photograph, but they're all the same.